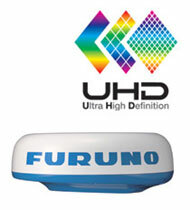 Click the button below to add the Furuno DRS4D 4kW Digital Radar Radome to your wish list. Antenna rotation speed (24/36/48 rpm) is automatically shifted to the appropriate pulse length. Commercial-grade radar performance is now available in the ultimate MFD navigation suite. The DRS2D incorporates a 4kW T/R within a sleek 24" radome.